DUP LEADER ARLENE Foster has said she will not support British Prime Minister Theresa May’s decision to have a Northern Ireland specific backstop. The letter from May, leaked to the Times of London, suggests Brussels plans to put a customs border in the Irish sea in the event of a no-deal Brexit. Speaking to RTÉ news, Foster questioned the motivation for this leak and said her problem with the letter was that May had confirmed a Northern Ireland specific backstop with Chequers for the rest of the UK. “In other words, we will have a different regulatory regime from the rest of the United Kindgom and essentially there’s going to be a border down the Irish sea and no unionist would be able to support that,” she said. Foster said the proposal would cause a “democratic deficit” and she fears it would cause Northern Ireland to diverge away from the United Kingdom. She claimed he Irish government does not need a backstop to prevent a hard border, rather it needs a ‘trading relationship’. 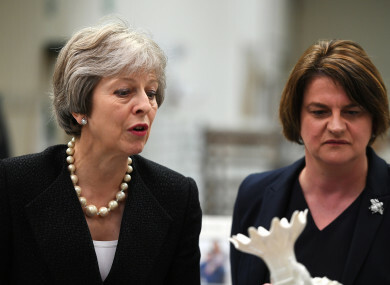 Foster said the British Prime Minister now has to decide if she wants to push forward with this proposal without the support of the 10 DUP MPs. Her comments came as Transport Minister Jo Johnson – Boris Johnson’s brother – resigned from government. Hognson said the UK is ”barrelling towards an incoherent Brexit that is going to leave us trapped in a subordinate relationship to the EU”. He called for the public to have another say on whether Britain should leave the union. Email “'No unionist can support that': Foster says DUP will not back proposal for border in Irish Sea”. Feedback on “'No unionist can support that': Foster says DUP will not back proposal for border in Irish Sea”.